Echoes: As go the giant redwoods, so goes man. Sometimes it feels as though technology designed to improve our quality of life and give us more free time has turned on us. We are held hostage to the constant barrage of electronic messages that make it difficult to be productive or find any peace of mind. Cyber warfare threatens our infrastructure and institutions. The 24-hour news cycle brings the worst of the world to us everyday. It’s hard to imagine a future where man, through technology, will make a positive difference for the planet. But in the last few weeks I have found cause for encouragement. The first glimmer of light came in the form of a news story about redwood trees and one man’s plans to restore an old growth forest on the southern Oregon coast. David Milarch, co-founder of Archangel Ancient Tree Archive and the Champion Tree Project International has developed exact genetic duplicates of the largest and oldest living organisms on the planet, giant redwoods and sequoias, through cloning. It is just part of his mission to develop “champion” trees to help reforest the world. Among the dozens of unique individual tree clones to be planted in the coastal forest will be a duplicate of the Fieldbrook Redwood – a giant tree cut down in 1890 that measured 32.5 feet in trunk diameter. 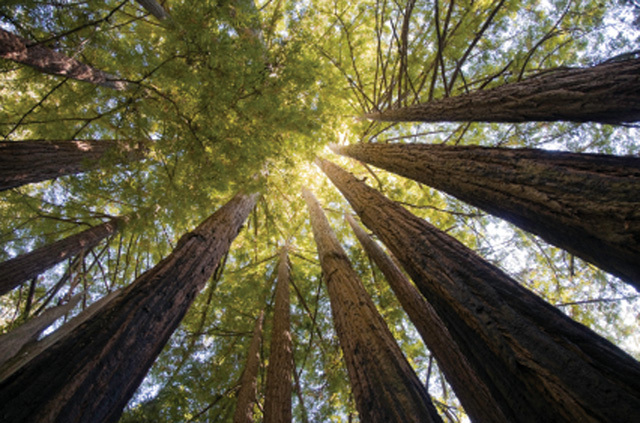 (The tallest coastal redwood recorded to date is 379.1 feet tall. This is the same height as a 37-story building.) Imagine cloning as an answer to repairing and healing the damage that centuries of timber cutting has done to our land, before the advent of more sustainable timber management. The second welcome surprise was discovered in my research to write the article about “Personalized Medicine” for this issue. Improved technology in genetic testing and mapping of the human genome has the potential to make medicine a more exact science by giving physicians the ability to customize diagnoses, treatment and disease management based on an individual’s unique genetic make-up, not by trial and error. Given the gargantuan cost to the healthcare industry of drug interactions and adverse reactions, as well as the expense in dollars and human suffering from late stage diagnoses and ineffective treatments, this technology has the potential to revolutionize healthcare and reverse spiraling costs while improving outcomes and increasing the quality of care. Who would have thought that a test as simple as a cheek swab could change the way we practice and deliver medical care. As I think about these two examples of how technology can be used for good, I realize just how “immature” we humans are in the scheme of things, and how much we still have to learn. Nature has a way of teaching us the long game. Once civilization and progress were measured by acres cleared and concrete poured. Now we are learning that the trees we cleared were crucial to the air we breathe, the water we drink and more. Our bounds toward industrialized medicine, in the effort to provide more care to more people, often gave less personal attention and more boiler-plate treatment. Now, we understand more than ever before the unique creation each of us is, and we are developing the tools to deliver healthcare designed for the individual. What an amazing testament to the wonder of life that the DNA of a noble giant cut down in its prime more than 120 years ago, could hold the secret to the earth’s reforestation, and the DNA that defines each of us as humans, could be the key to longer and healthier lives. Ain’t technology grand…or maybe nature just taught us another lesson!